In the mid-1960s, Ferrari launched a mid-engined Formula 1 race car, the 1512, which featured an all-new flat-12 cylinder engine design. Enzo Ferrari always believed two things: that his road cars should have their V12 engine in the front of the car, and that a mid-engine design could not be handled by the average road car driver. However, in 1968, Ferrari bowed to the pressure of the market and introduced their first mid-engined road car, the Dino 206, and then in 1973, the radical new 365 BB was launched, with a flat-12 engine derived from the F1 car of the 60s in an all-new mid-engine chassis. The 365 BB evolved into the 512BB a few years later, and then fuel injection replaced carburation in 1980 with the ultimate evolution of the "Berlinetta Boxer", the 512BBi. None of the BB cars were ever produced for sale in the United States. However, many examples were imported, especially in the early and mid-1980s, but these cars had to undergo the federalization process, adding power-robbing emissions equipment, heavy bumpers, and other undesirable changes. To find a "non-federalized" BB is quite rare, but I am pleased to present this exquisite 1982 Ferrari 512BBi, imported to the United States in recent years, and hence has never undergone the federalization process. Resplendent in its single-color Rosso Corsa paintwork (most BB cars were painted in a two-tone color scheme, with the bottom half of the car in black, known as the "Boxer" colors), and with the classic Ferrari beige interior and red carpets, this 512BBi is truly a stunning car. The paint is in excellent condition, and the interior is equally excellent, both having been professionally refreshed in this car's recent history. Currently, the car is undergoing a full "major" engine-out service, including changing the cam timing belts, and will be completely mechanically refreshed. And, the suspension components are being refurbished or replaced as necessary. (More details on the mechanical work is available by request.) Once the mechanicals are complete, this 512BBi will be ready for full enjoyment on the road or as part of a discriminating owner's collection. 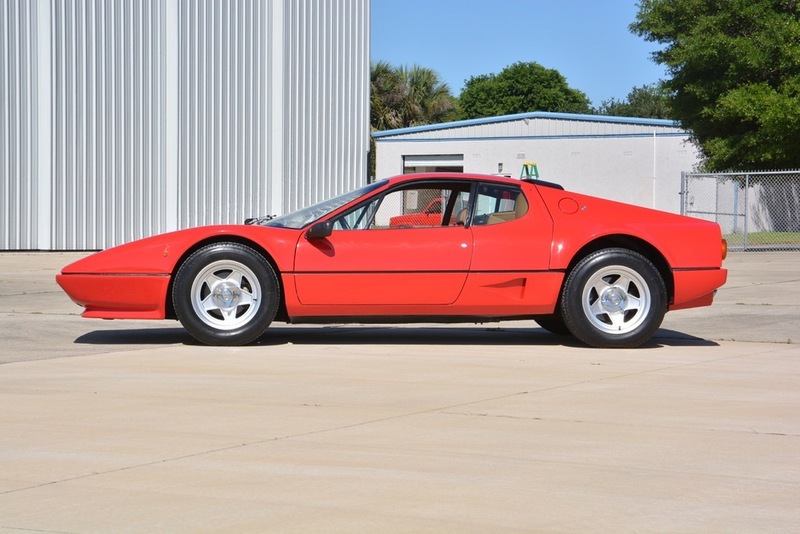 I look forward to discussing this very special 1982 Ferrari 512BBi with you further. For more information, please contact Michael Foertsch at michael@mbrandonmotorcars.com or 832-617-0494.